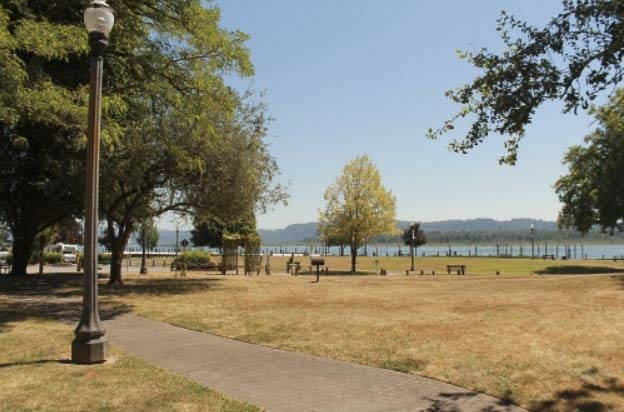 WASHOUGAL — Clark County’s Historic Preservation Commission has listed the Parkersville Landing Site to the Clark County Heritage Register. The site is located off State Route 14 on the Columbia River in Washougal adjacent to the Camas-Washougal Port Authority at 24 South A St.
Parkersville Landing Site, also known as Parkers Landing National Historic Site and Parkersville Landing Historic Park, has figured prominently in the state’s history from the time before European settlers to the development of the southeast Clark County area. The site was added to the National Register of Historic Places and the Washington State Heritage Register in 1976. Since 1978, the Parkersville site has been a 3.88-acre public park owned by the Port of Camas-Washougal. Today, the park includes a walking path that connects commemorative features, such as the Van Vleet Historical Plaza and Chinook Plaza. The site is associated with the Chinook-speaking people who occupied the region for many centuries before Europeans came to the area. British explorers were the first documented Europeans to visit the area in 1792. Lewis and Clark later explored the area in 1806. The site is named for David C. Parker, the first permanent American settler in Clark County. For more information about the history of the Parkersville Landing Site or the Clark County Historic Preservation program, please contact Community Planning at (564) 397-4909. Information also is available on the county’s website at www.clark.wa.gov/community-planning/parkersville-national-historic-site.